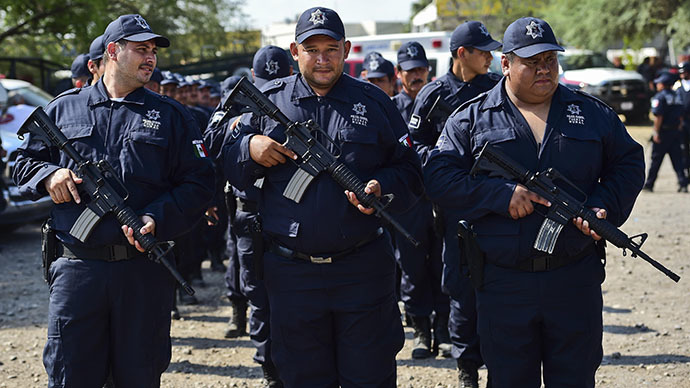 Thousands of Mexican vigilantes are signing up to become part of a new rural police force. The government decided to bring the 20,000-strong “self-defense” group under state control amid worries it could turn into a powerful military force. 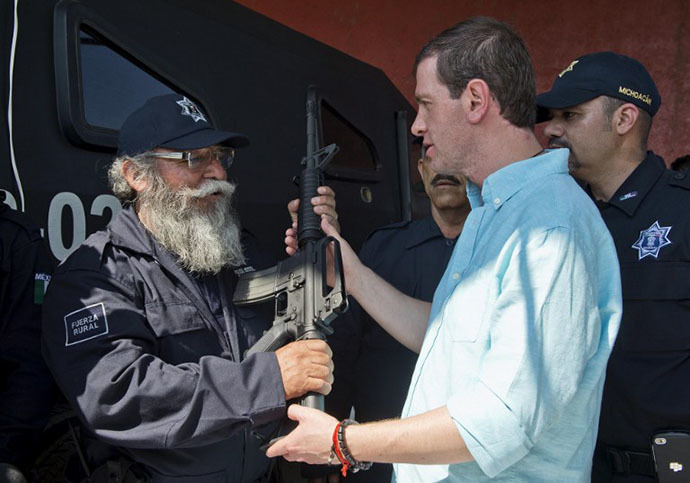 The regional government of the western Mexican state of Michoacan began to hand out blue uniforms and assault rifles to vigilantes Saturday. They will form part of a nascent rural police organization that will support the Armed Forces in the fight against organized crime in the region. Around 3,300 vigilantes out of an estimated 20,000 were sworn in during mass ceremonies Saturday by the local government. The leader of the vigilantes, Estanislao Beltran, nicknamed “Papa Smurf” by his compatriots because of his long white beard, said their fight against the cartels had just begun. “We are not illegal,” Beltran told AFP, after putting on his new uniform. With this change “we are part of the government,” he added. After Saturday’s ceremonies, authorities said there will be time over the course of the next few days for more vigilantes to sign up. Anyone caught illegally bearing arms from now on in the state of Michoacan will be arrested, the authorities said Saturday. 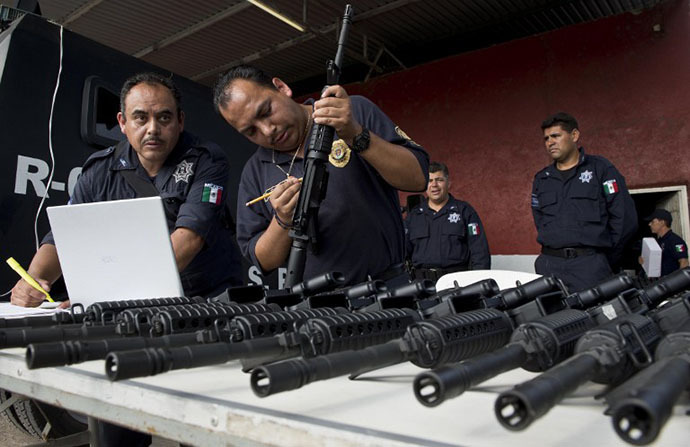 The local government has grudgingly tolerated vigilantism in Michoacan over the past year, with locals claiming they are forced to take up arms to defend themselves against local drug cartels. Previously, the vigilantes had been part of a “self-defense” group that was created in February 2013 to combat the infamous Knights Templar drug cartel which has terrorized the region since 2010. 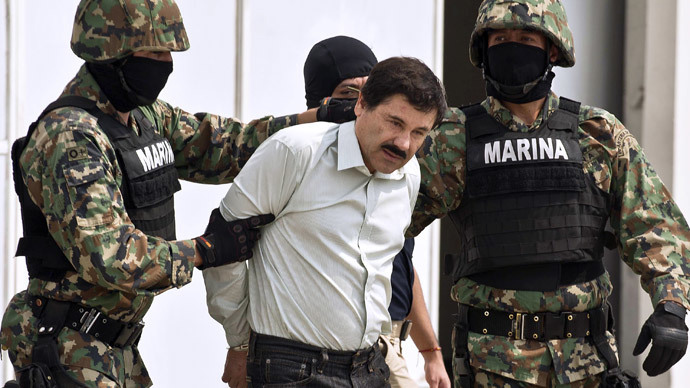 However, the vigilante movement became a source of concern for the Mexican government after two of its previous leaders were accused of murder. The self-defense force’s council dismissed one of the group’s founders, and the spokesman for the movement, Jose Mireles, on Thursday. It was decided he could not continue in the group after it was revealed he was involved in the killing of five civilians. In addition, another founder of the group, Hipolito Mora, was arrested in connection with the murder of two other vigilantes. Earlier this week, Mora admitted on local radio that the vigilante organization had been infiltrated by organized crime. 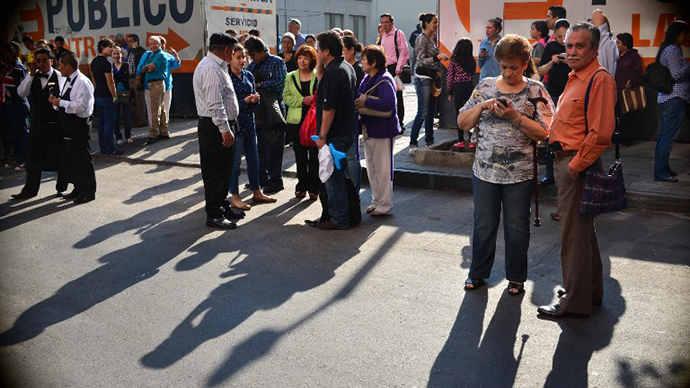 Security in the state of Michoacan has been one of the top priorities for Mexican President Enrique Pena Nieto following his election in 2012. His government has deployed thousands of troops in the region to combat the activities of the Knights Templar cartel. Currently, security forces are seeking to apprehend the head of the cartel, Servando Gomez, or “The Teacher,” as he is also known. The war against drugs has left parts of Mexico almost completely lawless with up to 120,000 people killed, according to some estimates.